The winner of Beat It #4 with Matt Bomer is Karli Rush, author of dark, paranormal romance. The post on her upcoming release, Let Your Heart Drive, will be published on May 11. You can’t know me well enough if you’re not aware of my ongoing Kristen Stewart fanship. I even have a Pinterest board dedicated to her. It’s a wonder I didn’t start this meme with her, but this week is all about the Queen of brooding chic. Don’t you sometimes struggle to add the right body language description (beat) to amp up your dialog? One that conjures just the right image, is not cliché and sounds fresh? Then this meme-type exercise is for you. Read on for a quick how-to. Take a good look at the GIF below. Using the scene set up I give you, describe the body language you see just as you’d do if you were writing out the scene yourself. 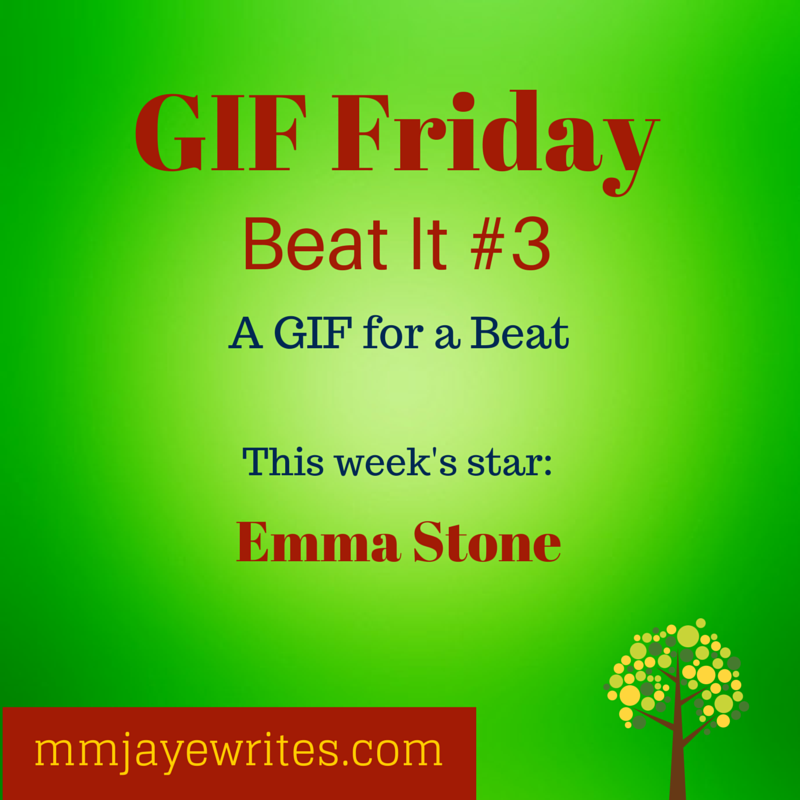 Post your “beat” until Wednesday as a comment here, blog it, post on Facebook, wherever. If you don’t post here, leave a comment with a link to where you posted, so I can find you. I will then update this page to include all offerings I gather with links to participants’ sites or social media. No judging, no winners. My aim is to gather lots of different body language beats describing a visual action/reaction for my readers (and yours) to read and maybe learn. An added perk: each week, I’ll choose a random participant who will get FREE book promo on my promo blog mmjayepresents.com. With a weird military salute her clingy friends leave. Finally. I’ve been nursing my empty coffee mug for half an hour. She stayed behind. That must be a good sign, right? I try to ignore the flutter in my heart. I have set myself up for rejection, and I’m not used to that. But she’s different. I might be the school’s baseball star, but she’s the one who serves mean curveballs. That land right onto my stomach. So what it’ll be? Will she say ‘yes’ this time or not? End this story the way you want. Remember to add a workable link in your comment so that I can credit you properly. “Are you properly warmed up?” My trainer’s smirk smacked of arrogance, expecting me to stumble over his suggestive words and embarrass myself like I did yesterday. His white tank top made an even stronger statement. (insert beat) He motioned me to enter his studio. Better not mention the million-calory, death-by-chocolate waffle I gobbled up right after, I thought, closing the door behind me. If I had to resist an eyeful, at least I’d have my stomach full. I wonder why I suddenly have a strong sugar craving. Hmm… Your turn now. Remember to add a workable link in your comment so that I can credit you properly. Last week’s winner of a free book promo: C.H. Little for her newly released The Search. Check out the other awesome offerings of last week’s Beat It #2 with Kristin Kreuk. This week’s star is Emma Stone. She has such a mobile face, I couldn’t resist. I led her on. I kept the stutter, blinked whenever she looked at me and let her choose from the wine list. She went for the $100 Château Clinet, her eyes twinkling, probably relishing the prospect of embarrassing me when the bill came. She kept her condescending air throughout the meal, her speech over-enunciated as if talking to a hearing-impaired toddler. Either that or my affected stutter was infectious. “And what … are your plans after graduating? Will you … still live … at your mom’s?” Her nodding was nothing short of patronizing. I took off my glasses and tucked them in my breast pocket. Her breath exploded from her mouth. “Wow!” she mouthed, then turned away so I wouldn’t see her expression sour as if her Château Clinet had somehow turned into a bucket of vinegar. Somehow, I managed to keep my own face expressionless as I pretended to study a tiny crimson drop rolling down the inside of my glass. She stood up her face reddening. “Hell” she said “”wow, I’m astounded. You do realise I’ve been teasing you all night don’t you”? She sat down again with her jaw still opening and closing from little gasps of breath like a fish out of water.Gradually she paled and her shoulders slumped knowing she’d gone too far. At my news, her eyes widened and “wow” popped out of her mouth like meeting a rock star for the first time. Then the realization of my words sunk in and her mouth stayed agape for a second too long. She glanced away with her face holding the appalling thought that she’d just blown it. She recoiled from me as I spoke, the confidence draining from her body. She tried to hold my gaze and some measure of composure on her face, but as I finished speaking we both recognised my revelation had caught her off balance. She turned away from me, drawing breath and trying to compose herself, but she couldn’t hide the widening horror in her eyes and the way her shoulders slumped forward as her misjudgment sank in. Her eyes grew to the size of saucers. “Wow!”, she yelped, all pretence forgotten. Then, als the impact of my revelations fully hit her, she turned away. She wasn’t as much amazed as outrightly shocked. Her mouth opened to let out a moan of incredulous surprise. She was defeated, and the vertical line that appeared between her eyes gave away the anger she felt at herself. She had chosen the wrong tack with me, and the horror at having missed her chance crept all over her face. Thanks to all writers who came out and played this week! Two science fiction writers are last week’s winners: Margaret Fieland and Nicholas C. Rossis, who will both get free book promos. 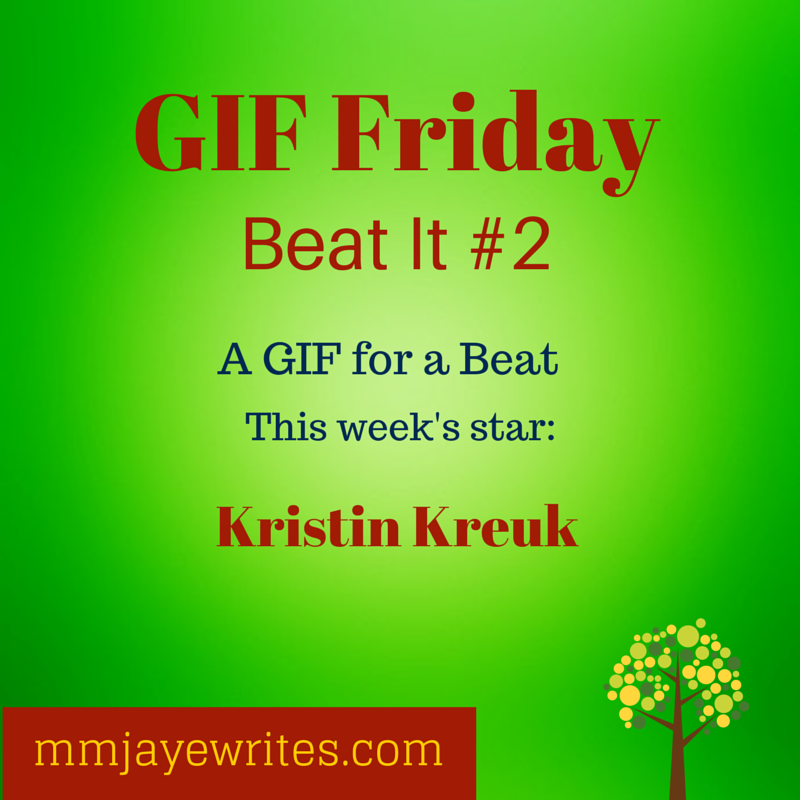 Check out GIF Friday: Beat It #1 to see how they described last week’s GIF. Would you like to join the fun? Then go ahead and “beat it”. My temples pounding in sync with the banging, I reach the shed and swing the door open. Yup, I found the source of all the noise that woke me, and boy, is she worked up. “Jesus. You assembled the bookcase by yourself?” I ask. The thing ate up the entire space. She stands up and brushes her hands on her jeans. “Well, I’ll leave you to ponder on that. You woke up at two in the afternoon. I’m sure you’re full of productive energy.” Passing by me, she pinches my cheek. “Just make sure it’s in our living room by five, before your parents arrive,” she says oh so sweetly. “I did promise them you’ll have it on display today. They paid for it, after all.” She leaves, closing the door behind her. I guess she found out Doug’s bachelor party wasn’t held at his basement. She blows off an errand strand of hair that tickles her nose. Her gaze bores two holes into my skull. Ants crawl up and down my spine. Those catlike eyes flash with fury she doesn’t bother to conceal. I’m in real trouble this time. An errant strand of the hair she never seems able to tame falls across her face and she blows it away impatiently, a challenge blazing in her eyes. She didn’t look up from her work so much as she could’ve broken her neck with the force of its upward trajectory. Her unblinking eyes bore into mine in silent challenge. She huffed powerfully, sending a loose strand of hair shooting above her sweaty brow. She looks up at me, a determination I haven’t seen before burning behind her eyes. She fixes me with her gaze, pouts her bottom lip and blows an errant strand of hair from her face defiantly. Her eyes are hard and her gaze doesn’t shift; only a twitch of her eye gives away any emotion as speaks. She looked at me defiantly. A loose strand of hair got in the way of her stare. Normally, she would sweetly tug it away behind her ear. Not now. She did away with it with a forceful blow of air from her mouth. The agressive, unyielding twitch of her eyes warned me not to mess with her, either. Don’t you sometimes struggle to add the right body language description (beat) to amp up your dialog? One that conjures just the right image, is not cliché and sounds fresh? Well, I do, and I hope this meme-type exercise proves helpful. I’m going through a phase of introspection writing-wise, and I’ve cut down on blogging and using social media as much as I did before (which was not much to begin with). BUT, I came up with this idea for a brand new meme that I think will be both fun and provide good training to that writing muscle of yours. Here’s the drill: I’ll post a GIF every Friday. It will be a close up of someone recognizable. I’ll give you a brief scene setup, and if you want to take part, you’ll have to describe the body language you see just as you’d do if you were writing the scene yourself. You can write it in the comments’ section, you can blog the meme using the same GIF, you can even post on Facebook. No weird linkies. You can post from Friday until Wednesday. I will then update this page to include all offerings I gather with links to participants’ sites or social media. The only requirement is for you to link back to my blog’s relevant post, and—if you don’t post here—leave a comment with a link to where you posted, so I can find you. Sounds like fun? Then go ahead and “beat it”. A glowing red charcoal rolled out of the fire pit. I used a stick to push it back. “What about your parents?” He was finally opening up. This was my window to peek in. He pulled his sleeve around his fingers and picked up the tin mug from the fire. He blew into the bubbling liquid. Steam surrounded his face as he stared at the mug with unseeing eyes. The rich aroma of his coffee hit my nostrils, making my mouth water. I said nothing, not wanting to interrupt his thoughts. His mouth quirked, but there was no humor in it. He looked away. Then he blinked. Several times. Were his eyes misting over?